I was all set to do a Monday link up to replace Man Candy Monday. It was going to be centered around weekend recaps and I was totally psyched, until plans changed. Now something even better is in the works and I'm 100x more excited! 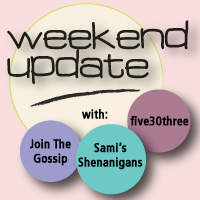 You see, now I'm teaming up with Sami of Sami's Shenanigans and Dana of Five30Three to bring you a new bloghop, same premise of a weekend recap! Each week we'll host a link up for anyone and everyone who is blogging about their weekend and wants to join in on the fun. We'll all have the same linkup, so you can add your blog post to any of our three blogs. This is a great way to meet new bloggers! Super cool link up idea! How fun that you all had the same idea! Yay for the Weekend Update! I'm so happy I actually have fun things planned for this weekend. Can't wait to hear about everyone else's weekend plans too. See you on Monday!! Woo! So excited! Glad we could all get together and do this :) Can't wait! Fun, fun, fun! I'll see what I can do! Whoohooo! So fun! I'll be in :) Thanks so much for sharing and thinking of such a great idea! That's great! If the blog hop is still open on Tuesday mornings I'll have to join. So excited! I will be linking up for sure! Sweet! I usually do a weekend wrap up so I'll definitely link up. Ooh sounds like a great idea! Can't wait! Fun stuff! I wish my life was more exciting. I hate posting about trips to the zoo, museum or park. Haha!